Red meat has been under the spotlight in recent years for its high environmental footprint. This comes from the amount of land, water and other resources given to rearing or growing food to feed cattle. It also comes from methane emissions emitted by cows during their lifetime. 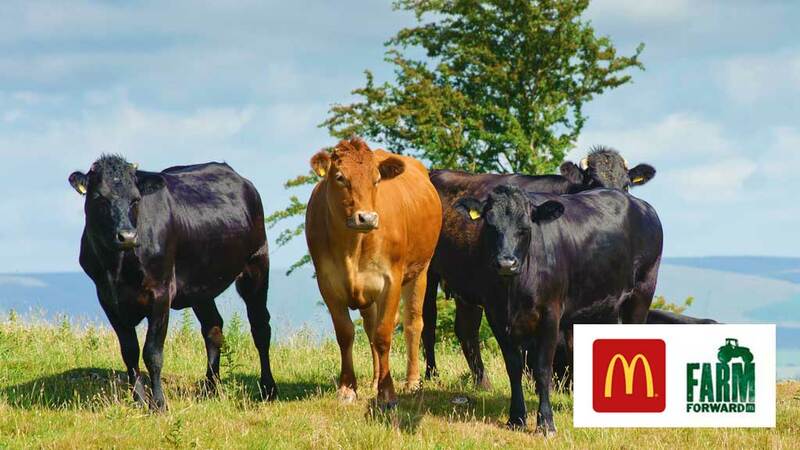 "Cattle are important because they complete the ecosystem of soil, plants and animal"
While the debate over veganism and animal welfare has attracted media interest and industry discussion, the resources used by beef cattle is arguably a bigger challenge for the sector to overcome. The biggest potential for reduction of both resources and climate emissions could come from improving production efficiencies: making more with less. This could include the use of better quality feed, improved breeding and animal health to reduce unproductive cattle. It is also about manure management practices which ensure recovery and recycling of nutrients and energy contained in manure, for example through a biogas plant. This process is already taking place, to an extent, in the UK. Steady improvements in production efficiency have taken place over recent years, with 5 per cent fewer prime cattle required to produce each tonne of meat in 2008 than in 1998, according to AHDB Beef and Lamb. That said, AHDB says the genetic potential for progress in beef breeds for improvements in feed efficiency is largely undeveloped. AHDB runs Farmbench, an online benchmarking tool which helps identify improvements which can be made by farm businesses. An analysis of this data, published last year, found eight key factors which the top 25 per cent of farms are performing well on, including minimising overhead costs, compiling budgets and comparing yourself to others and past performance. Away from the farm, the NFU has flagged up other improvements in efficiencies which can be made in the beef sector. Tom Dracup, NFU livestock adviser, says another solution being proposed which could drive sustainability is pasture-fed beef systems. Alex Brewster, a beef farmer near Dunkeld, Perthshire, explains: “Cattle are important as they complete the ecosystem of soil, plants and animals. If you graze them, we are harvesting soil energy and nutrients from plants. “With high stock density while grazing, we either eat the grass, or trample it in, to benefit mineral cycling by feeding soil biology. Mr Brewster farms in partnership with his parents and recently completed a Nuffield scholarship on the profitability of pasture-based farming. He says his system benefits the environment and his own financial sustainability. Clare Hill, farm manager at FAI farms, says while there are concerns around extended finishing periods from switching away from grain, pasture-fed systems could make sense to some farmers. She says: “It will only take grain prices to go up a bit to become unsustainable to feed beef animals with it, so if you have a model based on feeding large amounts of grain that may become less viable. Mrs Hill says the beef sector has catching up to do on utilising grass in systems to improve financial sustainability. According to the FAO, as much as 70 per cent of all agricultural land globally can only be utilised as grazing land for ruminant livestock. Mr Brewster says the climate and grazing land available in the UK presents a huge potential for many more farmers to switch to a pasture-fed production model. He says: “There is probably no mistaking that herbivores have grazed the planet for millions of years and evolved and developed with our grasslands, so the smart thing is to understand how they work together and mimic that in our business. I am sure they did not evolve on a grain-based diet or buying-in soy from Brazil. A bright future for the beef sector has to look at a system that works with the environment. While cattle raised mainly on pasture may have a positive image among consumers, their superior sustainability has been questioned. Researchers from the Food Climate Research Network (FCRN) at Oxford University have concluded if you look at the amount of land used and greenhouse gas emissions produced per kilogram of meat, pasture-based cattle actually have a greater impact in terms of greenhouse gases they are responsible for than animals fed grains and soy. Animals in more intensive, grain-fed systems, the researchers conclude, reach slaughter weight faster than grass-fed animals do, so emissions over the animal’s entire lifetime are lower. The downside to narrow focus on feed efficiency and climate emissions is that it could drive people away from beef production altogether. The FCRN report authors admit their analysis was based solely on the role of grazing animals in the net greenhouse gas balance. Lead author Dr Tara Garnett says: “We do not ask if they are better for biodiversity or whether these systems are more humane, or whether feeding human-edible grains to animals is a bad idea. For now, more research on the issue is needed to establish the environmental trade-offs between different beef farming systems, including pasture-based ones. But, Mr Dracup, says the diversity of beef enterprises in the UK actually provides an advantage when it comes to delivering sustainability outputs.